Half a million visitors are expected for this year's Ann Arbor art fairs. Traffic tie ups and parking shortages are bound to follow. 89-one WEMU’s Andrew Cluley opted to use the Ann Arbor Area Transportation Authority’s Art Fair bus this year. 89.1 WEMU's Andrew Cluley reports on his trip to the Ann Arbor Art fair on the Ann Arbor Area Transportation Authority's bus from Briarwood Mall. In less than ten minutes the art fair bus took me from free parking at Briarwood Mall to the edge of the Summer Art Fair on State Street. The early morning bus was full with people enjoying the cooler than normal weather. Round trip is 3 dollars and the buses run from 9 until 10 during the week and 9 to 7 on Saturday. Nearly 1,000 artists have come to Ann Arbor to sell their work in this year's Art Fair. About a half million visitors are expected at the 30 block event that is made up of 4 separate art fairs. 89.1 WEMU's Andrew Cluley previews this year's Ann Arbor Art Fair. About a thousand artists and a half million visitors are expected in Ann Arbor for the city's four art fairs. Before art takes over the city the 10th annual Townie Street Party is Monday night. 89.1 WEMU's Andrew Cluley reports on the Townie Street Party. The Ann Arbor Area Transportation Authority held the official grand opening of the new Blake Transit Center in downtown Ann Arbor today. It's been open since March but it will still be another week or so before buses will use the facility's covered driveway for loading and unloading passengers. 89.1 WEMU's Andrew Cluley reports on the grand opening of the Ann Arbor Area Transportation Authority's new Blake Transit Center. Ann Arbor homeless advocates hope the large turnout at a mayoral forum on the issue will show it's a priority to voters. If nothing else all four City Council members appearing on the democratic ballot for mayor pledged to commit financial and political capital to ending homelessness in the city by 2018. 89.1 WEMU's Andrew Cluley reports on Ann Arbor's mayoral forum focused on affordable housing and homeless issues. 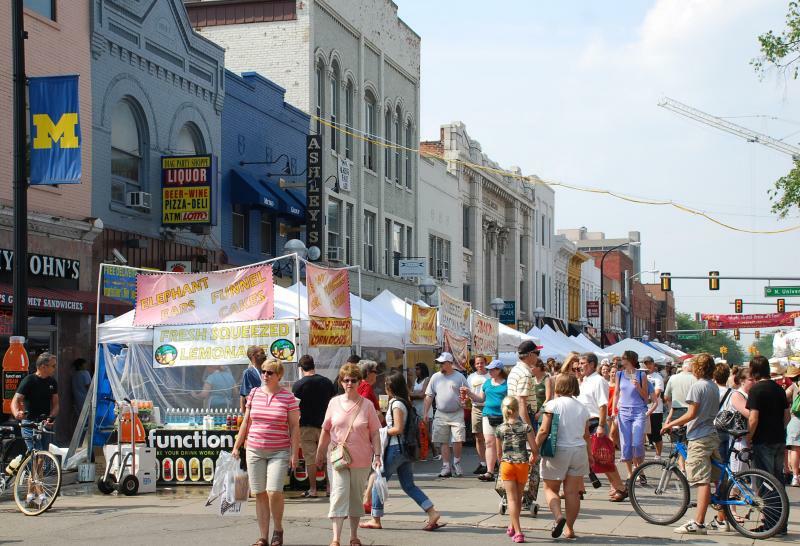 The Ann Arbor Art Fairs begin tomorrow and run through Saturday evening. As a result, there are several street closures downtown. The closures begin at 7:00am Tuesday morning and run through noon, Sunday, July 20th. The Ann Arbor Planning Commission is expected to set their work agenda for the year Tuesday night. That's when they vote on the annual review of the master plan. 89.1 WEMU's Andrew Cluley reports on the Ann Arbor Planning Commission setting up their agenda for the year as they consider a review of the city's master plan.